$359. Volcano water slide with splash pool. 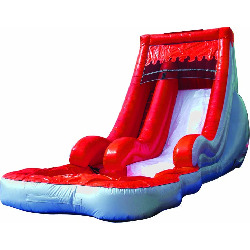 This towering Volcano slide with splash pool is sure to attract attention at your next big celebration. No need to climb a mountain, this lava-filled wet/dry slide takes riders up a 15-foot climb, and turns them under the "lava" top. Riders cruise past the wave-shaped walls to land in the spacious, curving pool at the bottom. This slide will bring guests right to the Volcano's edge! The Volcano is a great way to promote enjoyable and healthy activity, and will add excitement and value to any indoor or outdoor event!